Egide Charles Gustave, Baron Wappers (1803 – 1874) was a well-known Belgian painter. Wappers was born in Antwerp at 23 August 1803. He studied at the Royal Academy of Fine Arts Antwerp and then went to Paris in 1826. The Romantic movement was then astir in France, and in that vehement struggle towards a new ideal artists and political men were thrown together. Wappers was the first Belgian artist to take advantage of this state of affairs, and his first exhibited picture, “The Devotion of the Burgomaster of Leiden,” appearing at the appropriate moment, had a marvellous success in the Brussels Salon of 1830, the opening year of the Belgian Revolution. The picture, although political, was in fact a remarkable work, which revolutionized the taste of Flemish painters. Wappers was invited to the court of Brussels, and was favoured with commissions. 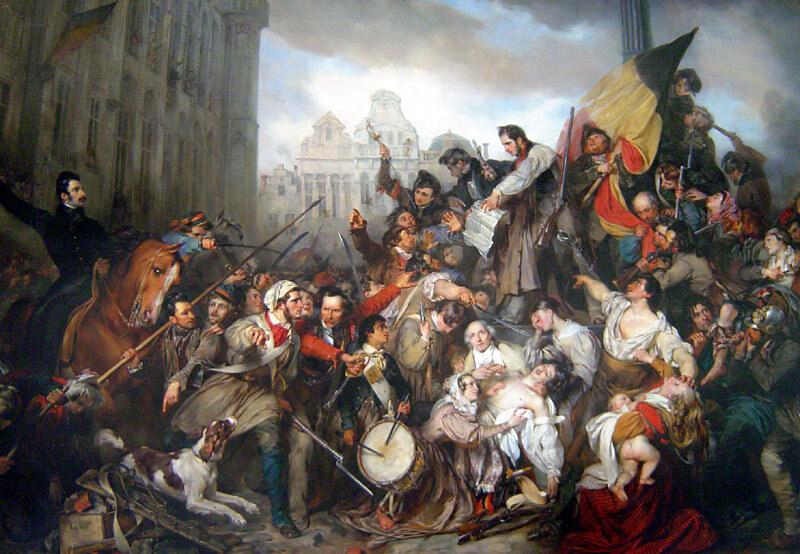 In 1832 the city of Antwerp appointed him professor of painting, and his triumph was complete when he exhibited at the Antwerp Salon of 1834 his masterpiece, “An Episode of the Belgian Revolution of 1830” (Musée d’Art Ancien, Brussels). He was subsequently appointed painter to Leopold, King of the Belgians; at the death of Matthieu-Ignace Van Brée in 1839 he was made director of the Antwerp Academy. One of his pupils was Ford Madox Brown. Louis Philippe gave him a commission to paint a large picture for the gallery at Versailles, “The Defence of Rhodes by the Knights of St John of Jerusalem,” a work finished in 1844, when he received from Leopold the title of baron. After retiring as director of the Antwerp Academy, he settled in 1853 in Paris, where he died. This entry was posted in Art, World History and tagged Belgium, Egide Charles Gustave Wappers by Eskeletto. Bookmark the permalink.